I guess I have had many breakthrough images over the years so it’s quite hard to pick out one single image. I have had a few moments shooting film in black & white and colour. Plenty of moments with wildlife and landscape shooting digital. But all pales into insignificance to my first love, Street Photography. I was finding it hard to find my feet with digital in the streets and this was for so many reasons, the main one being digital gear size! Shooting film with a Nikon Fm2 and 50mm lens was a breeze but shooting street with a DSLR was a nightmare. Everyone would look at me like I was the press, there was no chance of blending into the background so I stopped shooting street with digital. This image made me re think the way I shoot. The image was shot on a Nikon D3s with 300mm f2.8 lens. I had planned the image days if not weeks before I shot it, which lens I would use, what camera and position I needed. This was a high vantage point looking down Bold St Liverpool, out of the crowd and I captured the money shot! 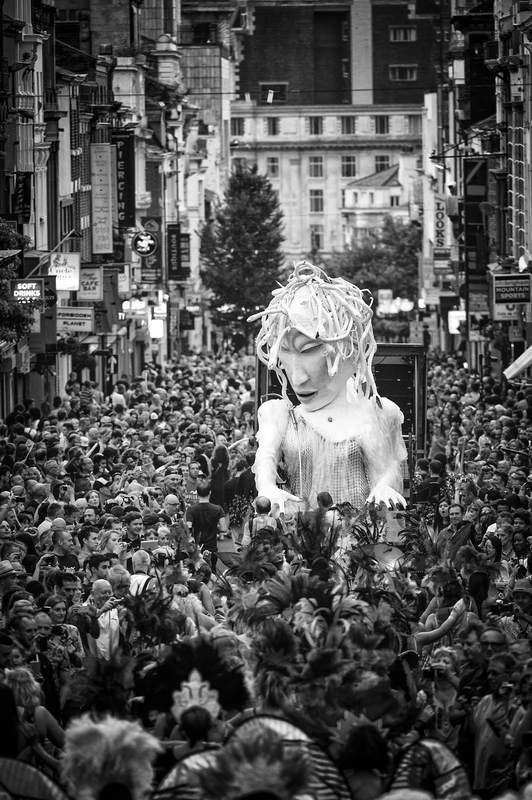 This shot would go on to be used in colour and black and white all over Liverpool for Brazilica 2014. I planned it by being at Brazillica 2013 and making notes. Success you might all be thinking and you could be right. I decided I would change the way I work as soon as possible because of this image. I was chasing the money shot and got exactly what I was after, but was it what I wanted for myself yes of course it was and the image I am very happy with but I was detached from the whole evening and this made me think! Sounds Crazy, but it was the turning point for me to start taking more time for me to shoot what I love most, Street Photography. I had stopped shooting Street for a very long time and this was the image that made me take a long hard look at myself deep inside and question what it was I wanted to shoot and what I was emotionally connected to. You only have to look at all the faces in the crowd having a good time and enjoying the Carnival Parade to realize you want to be down there, in the thick of it, shooting Street. Not the carnival parade but the people, the crowd, the characters and the atmosphere. I had lost my way and was shooting for profit and not for the love of Street and photography. This image changed all that. Nikon’s loss is our gain! Mirrorless is the only way forward ! Sounds more like an awakening than a breakthrough. Not a criticism. As somebody who also threw out a high end Nikon or two I applaud it. People do look at you differently when you are carrying a large SLR. Nobody gives me a second glance anymore and that’s the way I like it. Long may you revel in the thrill of the street by re-joining the ranks of the flaneur. Thanks and you are probably right, I am so glad I moved over to Fuji and Mirrorless when I did. The future is small form factor.